Last week I checked out J.Crew online lured by the promise of an additional 30% off sale items. 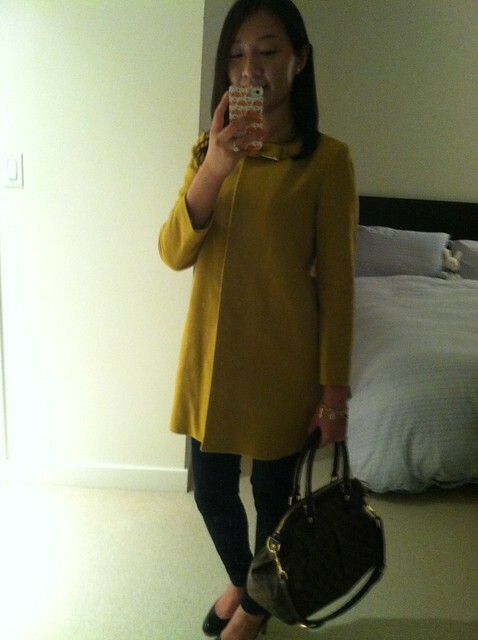 As usual I didn’t see anything I wanted in women’s so I turned to crewcuts and stumbled across this adorable coat*. Unfortunately only girl’s size 12 was available (I usually take size 14) but I ordered it anyway and hoped for the best. Khatu wore it here in bright pink, size 12. I prefer the girl’s version over the women’s version which has a funnel neck, strange bow placement and deep pockets. The girl’s version is a cleaner silhouette and it just screams cute. Interestingly, after reading Gigi’s review I realized that the girl’s version is a duplicate of the French serge day coat from 2008. Update 10/20/15: Check out the 2015 version of the crewcuts bow coat here. I was a little disappointed about the weight of the coat when I took it out of the box. I get cold easily in the winter and it’s a thinner coat so it’d be perfect for late fall and early spring here in New England. Alternatively, layers are definitely required to stay toasty. I tried it on noting that the sleeves were too short but when I looked in the mirror it looked adorable and my fiance agreed. 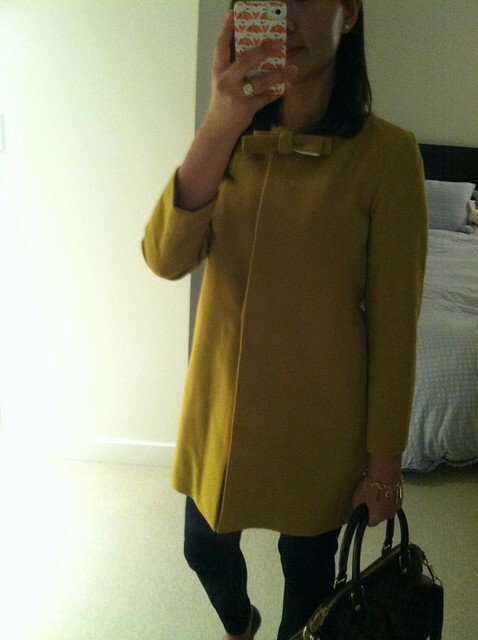 I think this coat can pass as a three-quarter length coat on me so I’m keeping it. After discounts I scored it for $97.99 and thank goodness for free shipping on crewcuts. Warmer weather is in store for us this weekend so I am really looking forward to wearing my new coat out and about town. *I just received the coat today. This coat has since sold out. I like it best when worn unbuttoned. Oh my gosh, it's sooooo adorable. Love it opened too with the bow!!! Great find!!!! 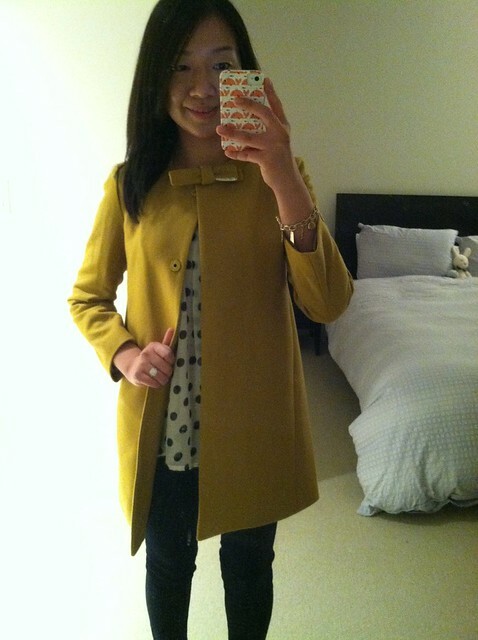 I adore this coat on you Jess. It's so feminine – love the bow detail and the color is perfect! Thanks Yi-Chia! Have a great weekend! I ordered some cute sandals on sale that I can't wait to review. Thanks Jessica! 🙂 I wore it all weekend and I'm in love with it. Adorable coat. 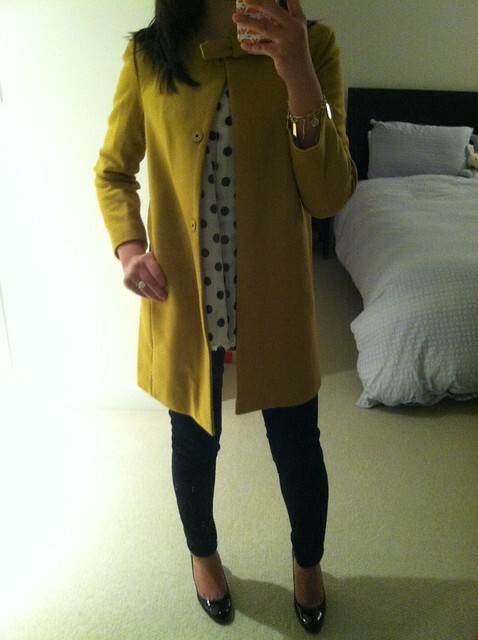 Love the mustard yellow color. Hey, Jess! I ordered a size 14 this morning. Hope it works for me. I love it on you, agree that the 3/4 sleeves are just fine. Thanks Vicky! I saw size 14 pop back up in the pink color. Is that the color you got? I hope it works out for you too! 🙂 FYI. I checked online and Size 14 was reviewed by Elle. I got the chartreuse. I don't think I can do the pink as well as Khatu. 🙂 I saw it on Elle. Looks a bit huge, but I can't resist. LOL. What? I checked at 7:30AM and only pink sz 14 was left. Khatu makes everything look nice. Hm… if the sz 14 is too big on you maybe we can swap (I have the measurements)? hehe Keep me posted! Will do. I don't think you are bigger than me though. Thanks!I think my arms are longer though. 🙁 I recall you trying on the same Zara white tweed jacket that I tried on during the summer.